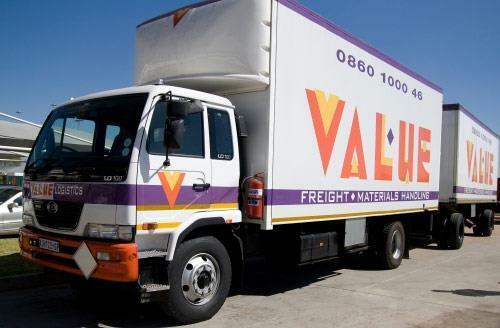 Value Logistics a division of the Value Group started in 1981 as a truck rental company and has evolved into one of the largest and most comprehensive transport and logistics companies in South Africa. Value Logistics now offers a full suite of supply chain solutions ranging from truck and car rentals to, logistics, express freight, warehousing, clearing and forwarding, air freight, picking and packing, materials handling and more. The momentum has continued with Value Logistics becoming a preferred supply chain partner for a large number of South Africa’s leading brands. Currently the company employs 2 170 permanent employees and 3100 contract staff. Value operates a fleet of 4100 vehicles through its national network of strategically positioned depots, warehouses and sorting facilities The Value Group has a long-standing relationship with Nissan Diesel South Africa (NDSA), dating back to the early 1990’s and 80% of their fleet comprises of Nissan Diesel trucks. Value Logistics is also presently a NDSA Service agent, with accredited workshops located in Isando, Pretoria, Durban, Port Elizabeth, Cape Town, West Rand and Bloemfontein. Value Logistics recently added to their fleet of Nissan Diesel vehicles by purchasing 34 UD 100’s, all fitted with draw bar trailers. The primary purpose of purchasing the UD 100’s is to cover both long- and short-haul deliveries through its logistics division. Vehicles will be utilised to do deliveries across South Africa and are expected to travel on gravel and tar surfaces, a feat which the UD 100 is perfectly capable of and designed for. The UD 100 houses a new and somewhat unique gearbox, drivers were specifically screened and selected and given special training to optimally use these vehicles. According to Jattie van Wyk, a divisional director of Value Logistics, the company has a longstanding relationship with Nissan Diesel and are very happy with the service that they have received over the years. “I am personally delighted with our purchase, as I have been looking for a truck that offers the unique capabilities of the UD 100 that can be used in all applications of our business for quite some time now. Our decision to go with the UD 100 has also pleased our drivers who comment on the great handling and good power delivery of the new vehicles, especially when pulling the draw bar set up,” continued van Wyk. Nissan Diesel’s versatile Heavy Commercial Vehicle (HCV) range of trucks has over the years built a strong reputation as some of the most reliable and durable trucks on the road, and the UD 100 is no different. This range has a very loyal following amongst some of the biggest construction and hauling companies in the country. The UD100 houses the turbocharged intercooler FE6TC engine that delivers 190kW of power and 710Nm of torque for enhanced operational performance. The engine operates with a timing and injection rate control system known as TICS or Timing and Injection Rate Control System. With the aid of TICS, the engine produces a higher power and torque output, as well as lower exhaust gas emissions at a lower fuel consumption rate. The UD100 also utilises a modern transmission, the 9-speed EATON FS6109. It is a robust and well-proven product that is housed in low mass split aluminium and utilises a single rail shifting selector mechanism. The FS6109 transmission is fully synchronised using proven baulk ring synchronisers with Eaton Friction Material II. Gear changes can be done in a single “H” shift pattern and a full Power Takeoff (PTO) range is available. The range has found favour in the market place as a proven, reliable, no-nonsense product that offers extensive application flexibility.